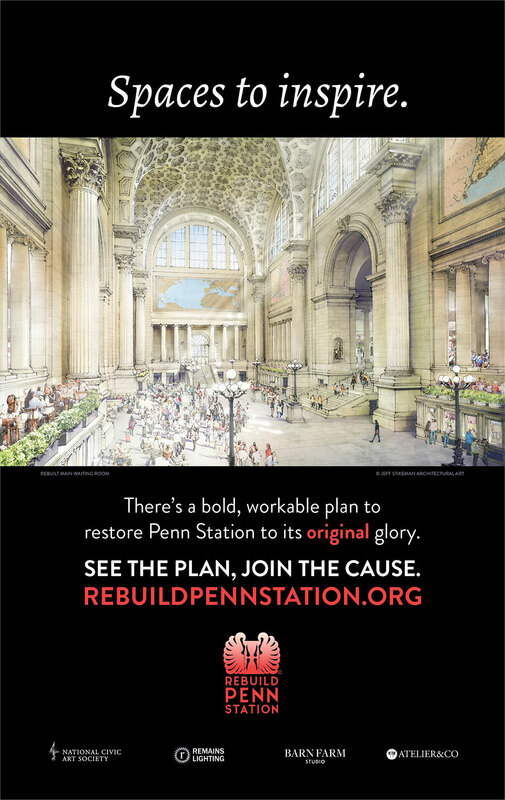 Only a few days before New York City’s Penn Station fills to capacity with Thanksgiving commuters, preservation group Rebuild Penn Station has begun an ad campaign that they hope will build popular support for their plan to reconstruct the original McKim, Mead & White station demolished in 1964. 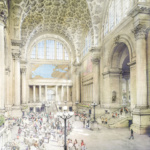 While their proposal is already ambitious in scope, it butts up directly against the $1.6 billion, Skidmore, Owings & Merrill (SOM)-designed redevelopment that Governor Cuomo unveiled in July. 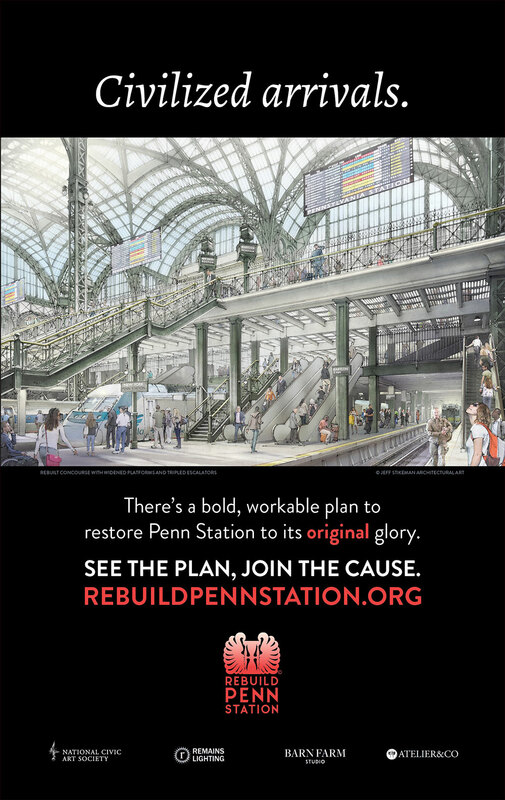 Rebuild Penn Station, a project of the National Civic Art Society, has plastered posters on trains arriving to Penn Station from New Jersey, and has been handing out fliers to Amtrak and Long Island Rail Road commuters there since Monday. 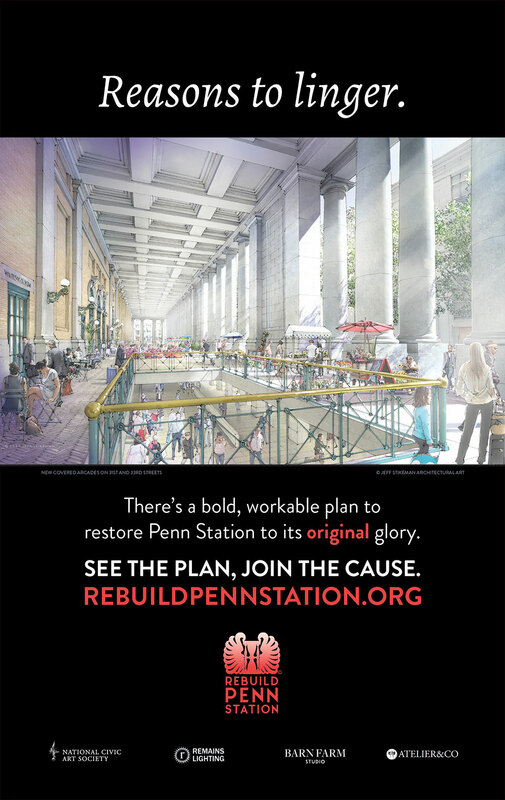 Filled with renderings of a “new old” Penn Station, the leaflets offer glimpses of “civilized arrivals” and “the station we deserve”. 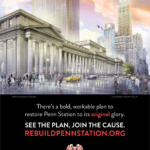 The group’s $3 to $3.5 billion plan would relocate Madison Square Garden, an action deemed prohibitively expensive by the governor’s office, and faithfully re-create the original Penn Station using modern construction techniques. 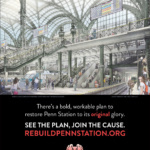 “[…] Modern panelization technology will allow the station to be built with just one-fifth of the original stone,” according to the frequently asked questions section on Rebuild Penn Station’s website. 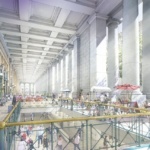 A complicating factor in this grand vision is that work on SOM’s renovation broke ground earlier this August. 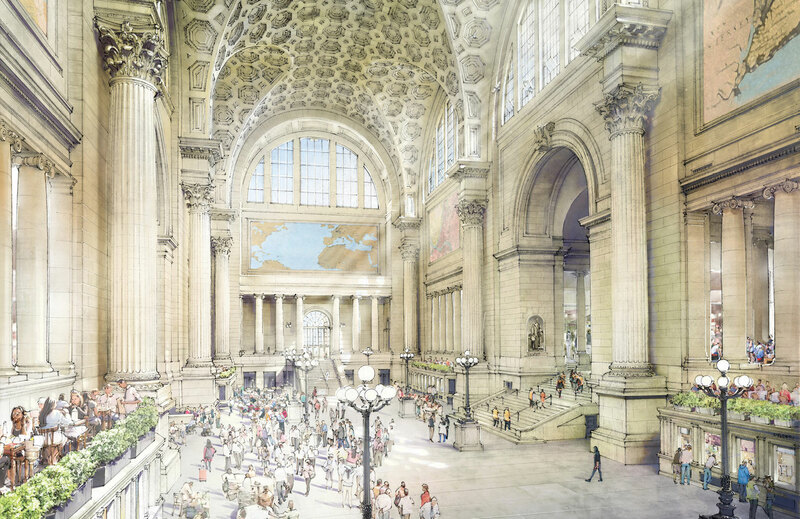 Instead of moving Madison Square Garden, the James A. Farley Building on 34th Street and Eighth Avenue also designed by McKim, Mead & White, will be converted from a former post office into a transit hub and extension of Penn Station. 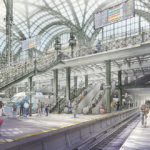 The Farley Building’s new Moynihan Train Hall will add retail, restaurants, and nine platforms with 17 tracks. 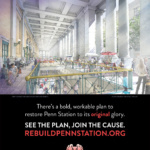 A 92-foot-high skylight will also be built over the Farley Building’s exposed steel trusses, echoing the cavernous glass ceiling of the original Penn Station. 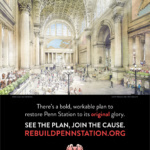 Still, Rebuild Penn Station feels that these changes aren’t going far enough. 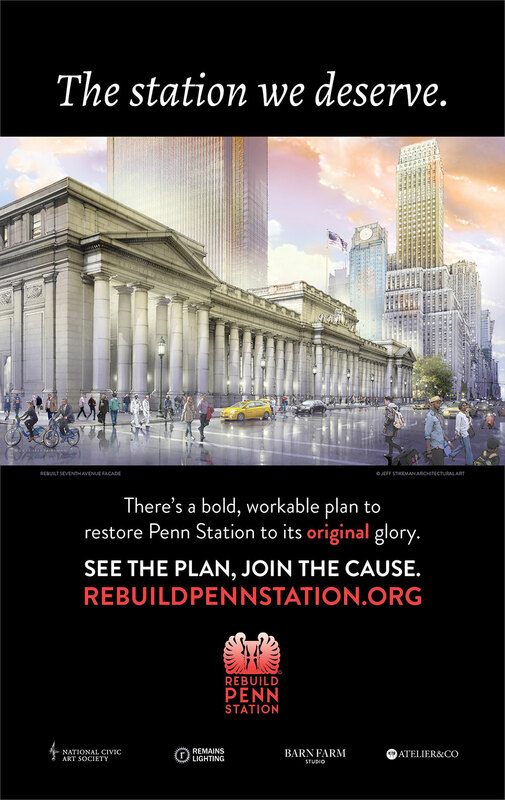 This isn’t the first time an alternative proposal for a new Penn Station has been floated. 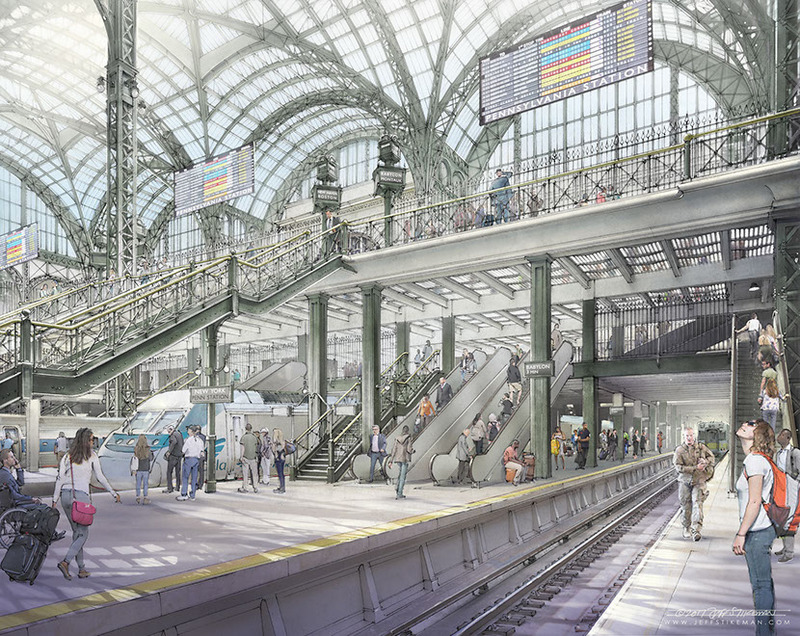 Last year, the New York Times commissioned Vishaan Chakrabarti to further detail his plan to reclad Madison Square Garden in double-paned glass, creating a multi-level atrium over the station. However, this still remains a proposal. 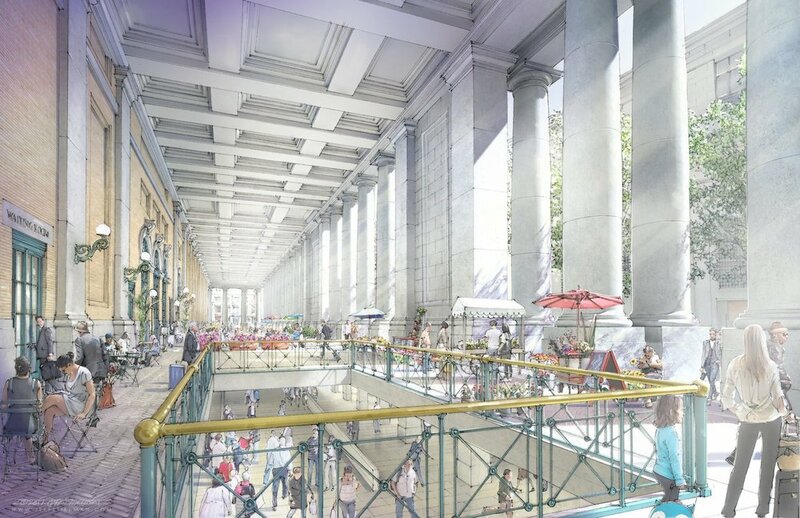 The new Moynihan Hall is on track for completion in 2020.